This image shows the range of voluntary movement prior to receiving stimulation compared to movement after receiving stimulation, physical conditioning, and buspirone. The subject’s legs are supported so that they can move without resistance from gravity. The electrodes on the legs are used for recording muscle activity. Five men with complete motor paralysis were able to voluntarily generate step-like movements thanks to a new strategy that non-invasively delivers electrical stimulation to their spinal cords, according to a new study funded in part by the National Institutes of Health. The strategy, called transcutaneous stimulation, delivers electrical current to the spinal cord by way of electrodes strategically placed on the skin of the lower back. This expands to nine the number of completely paralyzed individuals who have achieved voluntary movement while receiving spinal stimulation, though this is the first time the stimulation was delivered non-invasively. Previously it was delivered via an electrical stimulation device surgically implanted on the spinal cord. In the study, the men’s movements occurred while their legs were suspended in braces that hung from the ceiling, allowing them to move freely without resistance from gravity. Movement in this environment is not comparable to walking; nevertheless, the results signal significant progress towards the eventual goal of developing a therapy for a wide range of individuals with spinal cord injury. The study was conducted by a team of researchers at the University of California, Los Angeles; University of California, San Francisco; and the Pavlov Institute, St. Petersburg, Russia. The team was led by V. Reggie Edgerton, Ph.D., a distinguished professor of integrative biology and physiology at UCLA and Yury Gerasimenko, Ph.D., director of the laboratory of movement physiology at Pavlov Institute and a researcher in UCLA’s Department of Integrative Biology and Physiology. They reported their results in the Journal of Neurotrauma. In a study published a little over a year ago, Edgerton–along with Susan Harkema, Ph.D., and Claudia Angeli, Ph.D., from the University of Louisville, Kentucky–reported that four men with complete motor paralysis were able to generate some voluntary movements while receiving electrical stimulation to their spinal cords. The stimulation came from a device called an epidural stimulator that was surgically implanted on the surface of the men’s spinal cords. On the heels of that success, Edgerton and colleagues began developing a strategy for delivering stimulation to the spinal cord non-invasively, believing it could greatly expand the number of paralyzed individuals who could potentially benefit from spinal stimulation. 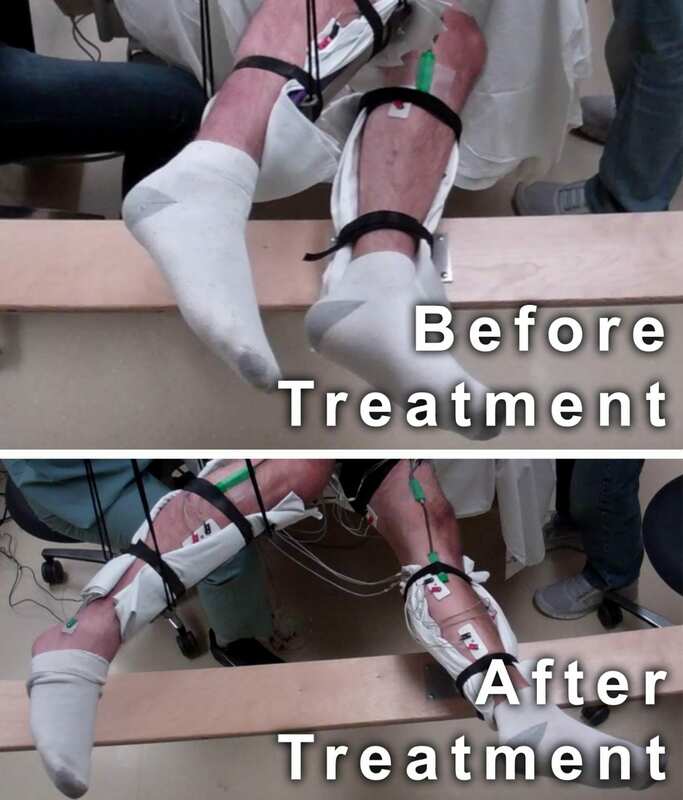 During this most recent study, five men–each paralyzed for more than two years–underwent a series of 45 minute sessions, once a week, for approximately 18 weeks, to determine the effects of non-invasive electrical stimulation on their ability to move their legs. In addition to stimulation, the men received several minutes of conditioning each session, during which their legs were moved manually for them in a step-like pattern. The goal of the conditioning was to assess whether physical training combined with electrical stimulation could enhance efforts to move voluntarily. For the final four weeks of the study, the men were given the pharmacological drug buspirone, which mimics the action of serotonin and has been shown to induce locomotion in mice with spinal cord injuries. While receiving the stimulation, the men were instructed at different points to either try to move their legs or to remain passive. At the initiation of the study, the men’s legs only moved when the stimulation was strong enough to generate involuntary step-like movements. However, when the men attempted to move their legs further while receiving stimulation, their range of movement significantly increased. After just four weeks of receiving stimulation and physical training, the men were able to double their range of motion when voluntarily moving their legs while receiving stimulation. The researchers suggest that this change was due to the ability of electrical stimulation to reawaken dormant connections that may exist between the brain and the spinal cord of patients with complete motor paralysis. Surprisingly, by the end of the study, and following the addition of buspirone, the men were able to move their legs with no stimulation at all and their range of movement was–on average–the same as when they were moving while receiving stimulation. “It’s as if we’ve reawakened some networks so that once the individuals learned how to use those networks, they become less dependent and even independent of the stimulation,” said Edgerton. April 1, 2019 - Stimwave Announces Publication of Groundbreaking 10 kHz Freedom Stimulator SURF RCT Results in Pain Medicine Associated PressPress release *content* from Business Wire. The AP news staff was not involved in its creation. September 24, 2018 - Spinal cord stimulation, physical therapy help paralyzed man stand, walk with assistance Science DailySpinal cord stimulation and physical therapy have helped a man paralyzed since 2013 regain his ability to stand and walk with assistance. April 7, 2019 - Electrical stimulation replaces medication pain treatment Innovation OriginsTechnology for pain treatment: Electrical stimulation of the vagus nerve in the ear offers a simple and lasting alternative to drug treatment of pain.